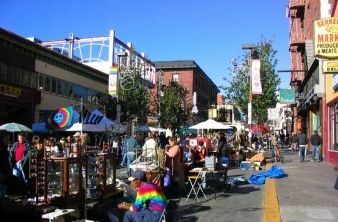 Berkeley is a city on the east shore of San Francisco Bay in northern Alameda County, California. It borders the cities of Oakland and Emeryville to the south and the city of Albany and the unincorporated community of Kensington to the north. Its eastern border with Contra Costa County generally follows the ridge of the Berkeley Hills. The 2010 census recorded a population of 112,580. Berkeley is home to the oldest campus in the University of California system, the University of California, Berkeley, and the Lawrence Berkeley National Laboratory, which is managed and operated by the University. It also has the Graduate Theological Union, one of the largest religious studies institutions in the world. Berkeley is one of the most socially liberal cities in the United States. The site of today's City of Berkeley was the territory of the Chochenyo/Huchiun band of the Ohlone people when the first Europeans arrived. Evidence of their existence in the area include pits in rock formations, which they used to grind acorns, and a shellmound, now mostly leveled and covered up, along the shoreline of San Francisco Bay at the mouth of Strawberry Creek. Other artifacts were discovered in the 1950s in the downtown area during remodeling of a commercial building, near the upper course of the creek.